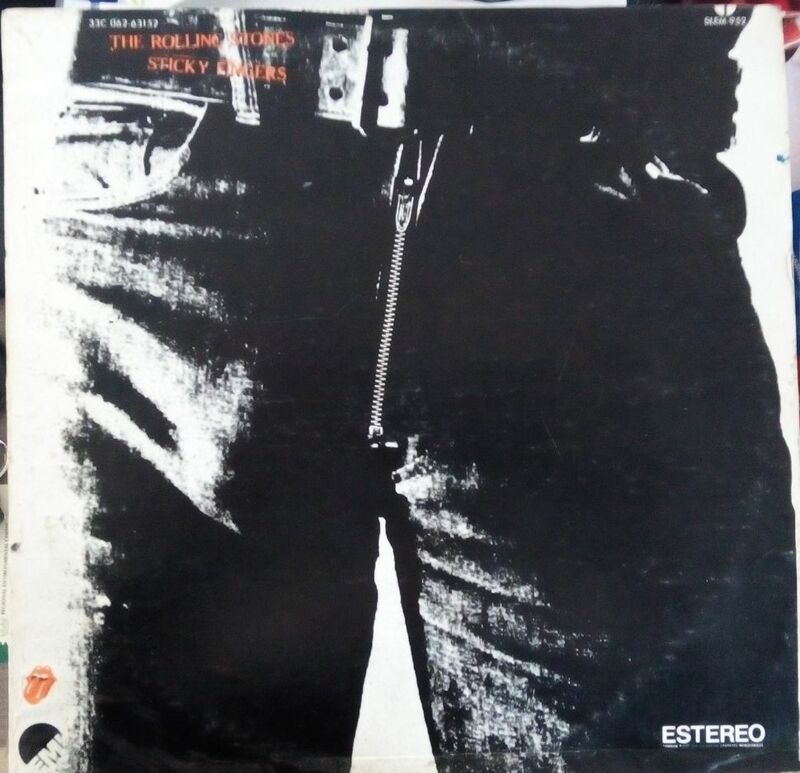 In the second week of June The Rolling Stones are going to officially rerelease their 1971 classic album Sticky Fingers, and all the songs will be played live during the Zip Code Tour in the US starting May 24. The album will be released in a wide variety of formats, and of course only the most expensive deluxe packages – with the original album, alternative versions of each track and a 1971 live gig in Leeds – will have a real zipper cover. Well, I’m a Warhol collector, not a Stones collector so luckily I do not feel obsessively obliged to buy all of these new editions. Although I’m very curious of course how they’ll all look like. With or without a working zipper. In the meantime, to honor the new release, let’s have a look at some different covers from the past that did NOT have a real zipper, but rather a picture with a zipper, or other creative solutions. You’d think they would all make use of the same picture, worldwide, but that was clearly not the case. My favourite is a release from Greece which has the original Warhol picture, unmodified, with no zipper visible at all. It might even have been a pair of jeans with buttons, who knows. Pictures of this original session can be seen in the Warhol Live catalogue. Greek release with no zipper at all: not a real one, not a printed one. Pictures of the original photo session for Sticky Fingers, in exhibition catalogue ‘Warhol Live’, Montreal, 2008 by Stephane Aquin,‎ Emma Lavigne and Matt Wrbican. 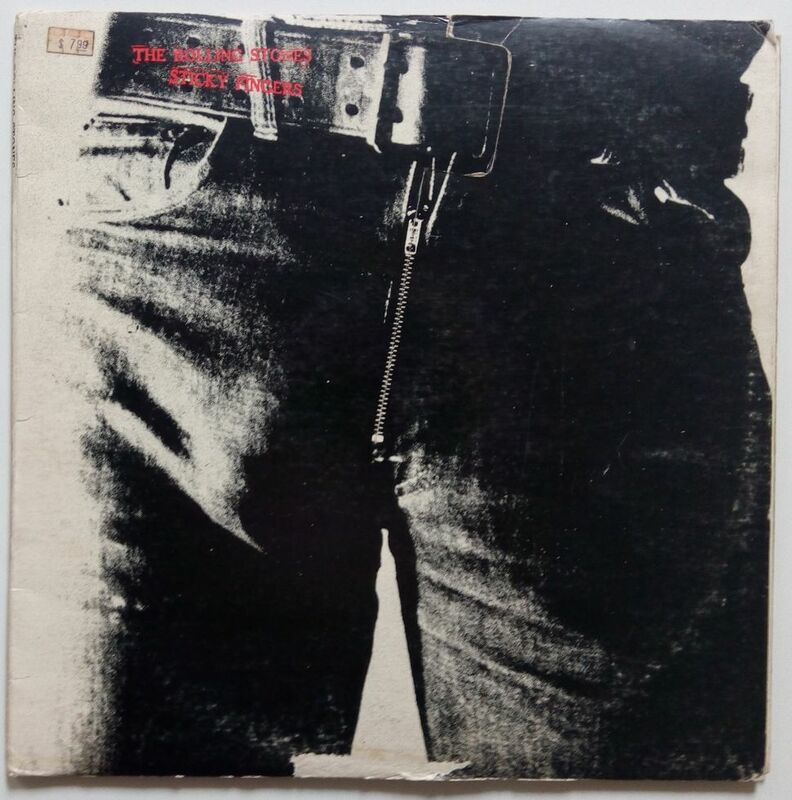 The only genuine gatefold of Sticky Fingers, was released in New Zealand in 1973. It had a laminated cover with printed zipper and a flipback with the underwear picture inside. Unfortunately, for a real gatefold, the printing quality of the underwear picture was very bad. 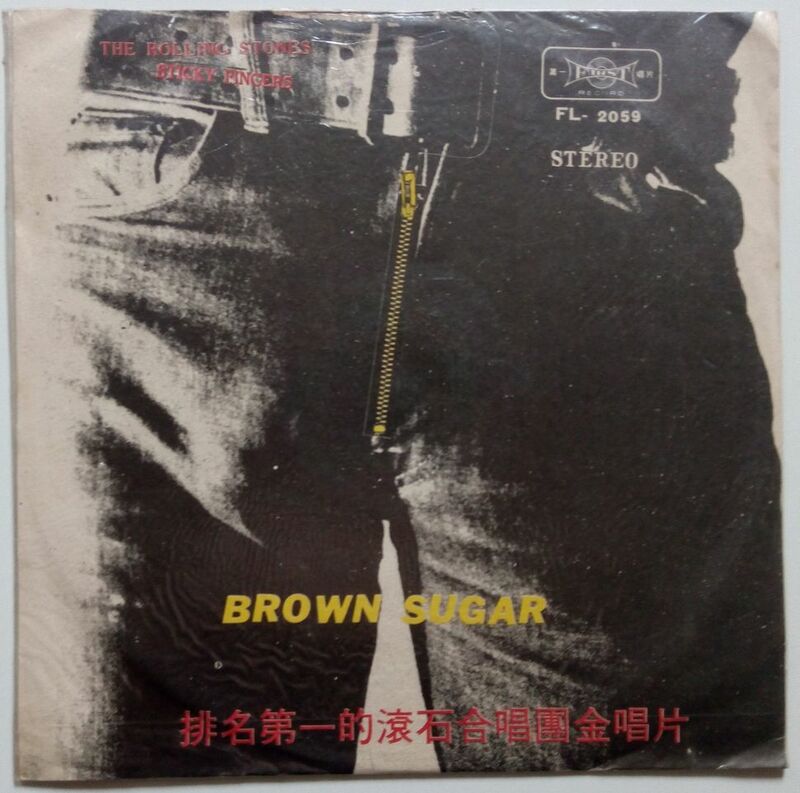 In Taiwan the LP was named Brown Sugar, and had a funnily drawn zipper. The MFSL release (Mobile Fidelity Sound Lab) had a non-working golden zipper in “bas-relief” pasted on the cover. Finally a cd release from the 80ies. Well this is what I have in my collection, there are a lot more versions out there! I just bumped into your blog from finding the recordart blog. Glad to be able to follow it starting from the ground floor. It’s Wonderful! 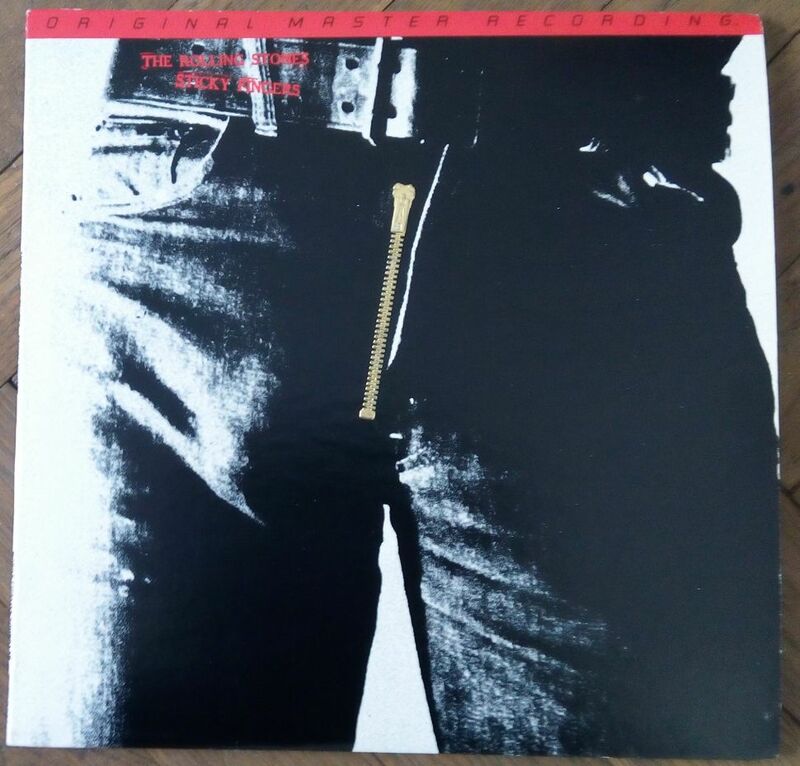 I had no idea there was ever a gatefold version of sticky fingers. I actually just inquired in a post on the recordart blog about one of my copies of sticky fingers. My boyfriend found a really beat up jacket in his uncles collection. When he pulled out the record it was signed by Andy in red marker. We have no idea if its a real signature and hopefully one day I’ll be able to have it authenticated. Even though the jacket is beat up it still has its zipper (it’s a canadian press, we live in Canada) and the nice thing is because who ever owned it before didn’t care is it has been opened gatefold so you can actual see the tighty Whities with the red andy warhol on the waist band.. Now the other cool thing about it besides the possible sig is that there is a scotland yard rubber stamp, stamped on its label in red. Have you ever come across a stamp like that or even a signed record? We did contact Scotland Yard and they were no help at all! I recently purchased a ‘Sticky Fingers’ album signed by Warhol, and it has (4) original red ‘Andy Warhol” rubber stamps (same as on the underneath cover) along the side of the front cover. Any info you may have would be greatly appreciated.